‘No Shirt, No Shoes… No Problem.’ You’ll see this sign everywhere in Belize, but no place is it more apt than Caye Caulker. Indeed, nothing seems to be a problem on this tiny island, where mangy dogs nap in the middle of the dirt road and suntanned cyclists pedal around them. The only traffic sign on the island instructs golf carts and bicycles to ‘go slow,’ a directive that is taken seriously. The 1000 or so residents have traditionally made their living from the sea, specifically from the spiny lobsters and red snapper that inhabit its warm waters. It has also long been a budget traveler’s mecca, but in recent years, tourists of all ages and incomes have begun to appreciate the island’s unique atmosphere. 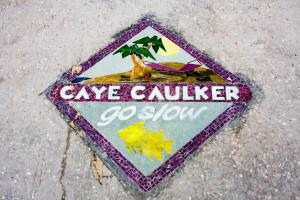 On Caye Caulker, there are no cars, no fumes and no hassles, just white sandy beaches, balmy breezes, fresh seafood, azure waters and a fantastic barrier reef at its doorstep. The easygoing attitude is due in part to the thriving Rastafarian culture on the Caye, which pulses to a reggae beat. If it’s not Bob Marley blaring from a boom box on the beach, it’s the latest in punta rock. Drumming groups gather on the beach and at local bars to get their Afro-Caribbean groove on. They play for themselves, but anybody is welcome to gather around and soak up the good vibes. The island is an ideal base for snorkeling and diving adventures at the nearby reef. The northern part of the island – a tempting destination for kayakers – is mostly mangroves, which are home to an amazing variety of birdlife. Other than that, all visitors should be sure to schedule in plenty of time for swinging on a hammock and enjoying the breeze.